The baseball team fell in its first contest of the season in a defensive bout versus Southeastern. Throughout the first three innings neither team could manage a hit. 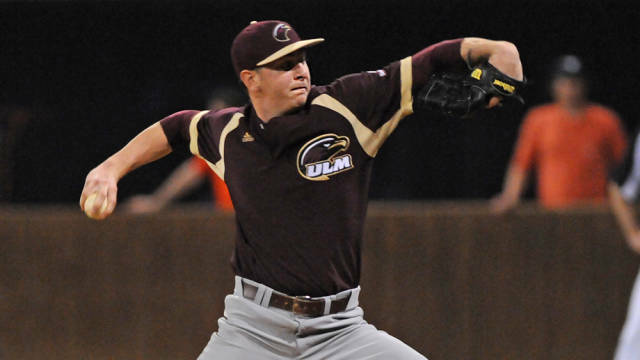 ULM looked poised to strike in the fourth as center fielder Cody Stone hit a double to left field. He advanced to third later in the inning but went no further. The sixth saw the Lions load the bases but the Warhawks held and Southeastern brought no runners home. Starting pitcher Bradyn Bouchey was relieved by Keller Bradford in the inning who struck out the last batter. It marked his first strikeout as a Warhawk. Bouchey went six innings and allowed two hits and tallied a career-high eight strikeouts. Pitcher Bradyn Bouchey tosses one to the plate versus Southeastern Friday. “The first couple innings I was commanding my fastball really well, and getting early contact. Then I had to rely more on the command of my offspeed pitches. I had spent a lot of time working on my changeup these last couple weeks, so it was nice to see that pitch working,” Bouchey said. In the eight the Lions finally broke through on a one-out RBI single to center field. Later in the inning Southeastern took advantage of a wild pitch to bring home their second and final winning run of the night. After holding Southeastern to two runs Friday the bats of the Lions came alive Saturday. The Lions jumped out to an early two nothing lead in the first. After ULM failed to tack on any runs themselves Southeastern added four more in the second to baloon the lead to six. In the fifth ULM finally got on board. Second baseman Anthony Herrera blasted one over the leftfield wall to give ULM their first run of the night. The homerun marked the first of his collegiate career. “It was definitely a good feeling after struggling the night before, but still wasn’t as great of a feeling as I imagined it to be since we still got the loss,” Herrera said. ULM scored once more in the seventh but it was not enough as the Lions went on to an 8-2 victory.